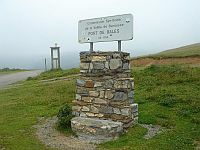 The Port de Bales (or Col de Bales) is located between the Oueil valley in the south and the Barousse valley in the north. It isn’t necessarily a pass you would ride unless you go out of your way to include it in a ride out, however, like many Pyrenean passes it offers stunning views and pretty scenery. It would certainly be a worthwhile addition to your bagging list if you have the time. It was virtually impassable until as recently as 2006 when it was resurfaced for inclusion as a part of the 15th stage in the 2007 Tour de France. It made a second appearance in the Tour de France in 2010, again as a part of the 15th stage, when Alberto Contador controversially took the yellow jersey from leader Andy Schleck. Starting in the south from Bagneres-de-Luchon the climb is 12 miles long and over this distance climbs 1,125m at an average percentage of 5.7 %, but with several sections over 11%. Starting in the north from Mauleon-Barousse the climb is also 12 miles long and over this distance climbs 1,185m at an average percentage of 6.3 %, with the steepest sections at over 11%. If you ever find yourself based in Bagneres-de-Luchon it’s only a few miles to the southern end of the climb at Bourg-d’Oueil – simply follow signs to Col de Peyresourde and take a right at Bourg-d’Oueil. From there the climb starts and the landscape changes from a grassy plateau at the head, to a steep sided, pine tree lined valley before drifting into green, rolling fertile hills. Mauleon-Barousse, 24 miles later, marks the base of the northern end. From there it’s a fast, open road back to Bagneres-de-Luchon.